Arrival At Amritsar And Shall Transfers To The Hotel, Overnight Stay At Hotel In Amritsar. Activities Same Day:- Visit To The Wagah Border For The Indo-Pak Evening Parade Ceremony. After Breakfast Shall Leave For The Local Sight Seeing Of Amritsar And By The Evening Shall Back To The Hotel For The Overnight Stay. 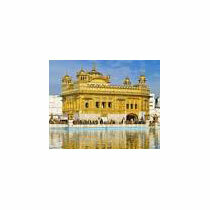 Activities Same Day:- Golden Temple, Durgiana Temple, Jallianwala Bagh, Hall Bazaar For Shopping. Eating Out Places:- Popular Bakery For Chicken Patty, Ahuja For Lassi, Barawon Da Dhaba For Meals. After Breakfast Shall Leave For Dalhousie Overnight Stay At Dalhousie. Chamba Activities:- Visit The Famous Luxmi Narayan Temple (Ancient And Historical Temple) And The Chamunda Temple (Famous For Its Ancient Wooden Carving) Both Are The Sidh Piths Of Chamba And Museum. After Breakfast Shall Leave For Amritsar To Catch The Evening Train To Way Back To Home With Beautiful Memories.